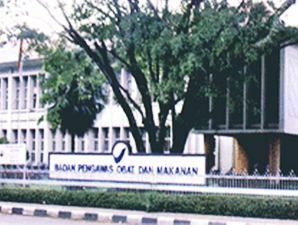 Badan Pengawas Obat dan Makanan Republik Indonesia - Badan POM RI or referred to as "POM" is the National Agency of Drug and Food Control of Republic Indonesia (NA-DFC). Badan POM RI is the national drug and food regulatory authority of Indonesia. The Agency is under and responsible directly to the President of Republic Indonesia. Based in Jakarta, the Agency now supported by 7 Balai POM offices, and 19 Balai Besar POM offices spread in all over Indonesia. The Agency's head office is registered at Jl Percetakan Negara No 23 Jakarta 10560. Since 20 July 2016, the Head of Badan POM RI held by Penny K Lukito. According to information found in the Badan POM's website, as cited by JobsCDC.com, the Head of Badan POM RI is assisted by 3 deputy, namely Deputy of Therapeutic Products and Narcotics, Psychotropic and Addictive Substance Control (Deputy I), Deputy of Traditional Medicines, Cosmetics and Complementary Product Control (Deputy II), and Deputy of Food Safety and Hazardous Substance Control (Deputy III). Maximum age of 27 years old on 1 February 2018. Able to reviewing traditional medicine. Education background in D3/S1 Accounting. Indonesian Citizen (WNI) who piety to God Almighty. Will not demand to be appointed to the Civil Service Office (PNS). Well behaved and physically and mentally healthy. Have a strong commitment and high opportunity according to the position of the proposed. Integrity, discipline, hardworking and honest. Minimum GPA of 2.75 from a leading university with minimum accreditation B (PTN/PTS). Latest color photograph size 4x6 (2 sheets). JobsCDC.com now available on android device. Download now on Google Play here. Please be aware of recruitment fraud. The entire stage of this selection process is free of charge. Badan Pengawas Obat dan Makanan - Recruitment Non CPNS POM January 2018 will never ask for fees or upfront payments for any purposes during the recruitment process such as transportation and accommodation.